A neighbourhood Italian restaurant near Kentish Town. Rossella is one of those precious, increasingly rare things in London: a sit-down restaurant where you can eat well for little more than a fiver. An intensely cosy, family-run Italian place, it occupies a patch of ungentrified ground between Kentish Town and Gospel Oak, just a few hundred yards from Hampstead Heath. Inside, it’s small and low-lit, with murals and an ice-cream bar up front. There are a couple of alfresco tables where you can sit in your coat and kid yourself you’re in Naples; in the summer it even throws a street party. Rossella’s a neighbourhood restaurant in the old-fashioned sense of the word. Most of the people who eat here don’t need to look at the menu; they’re local, and they’ve been coming here for years. The best dishes on the menu are the simplest. Spaghetti napoli (£5.50) was a deep bowl of beautifully al dente pasta – the tomato sauce slow-cooked, comforting and sweet. Carbonara, too, was fantastic: thick with cream and crispy pancetta, without being the least bit overwhelming. Of the small plates, the zucchini fritti – juicy little squares of courgette coated in golden batter – are a must-order. There was also a lovely caprese salad: a fat ball of mozzarella perched precariously on top of two garlicky slices of hot ciabatta. The pizza was also delicious. All priced between £6-£8, they’re large and gloriously un-trendy: both classic (napoli, margherita) and Americanised (‘feast’, four seasons) variations were served hot and oozy on thin crispy bases without any fuss. You can ask for mayo and chilli flakes and no one will judge you. The service here, by the way, is perfect. Everyone’s genuinely lovely and treats you like a regular. There’s a rotating menu of specials but, honestly, you don’t need them. The fancier the dish here, the more it tends to disappoint. Stick to the basics. 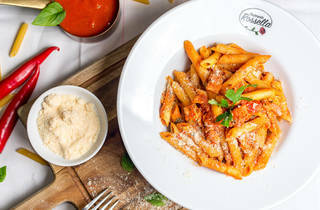 If I could pick my last meal on earth – for pure comfort factor – Rossella’s spaghetti napoli would be it. Dinner for two with drinks and service: around £45. Great food here, and all reasonably priced. Really good is the lunch menu of £7 including a main and drink. Huge range of pasta and pizza but all sound tempting, and the service here was excellent. Definitely try and book if you can as it gets fairly busy, even at lunch! Was recently in London (via USA) visiting friends and was taken to Rossella. Fresh authentic food, nice wine selection and great service. The taste is great and you get a real authentic feel from the food. Delicious!! 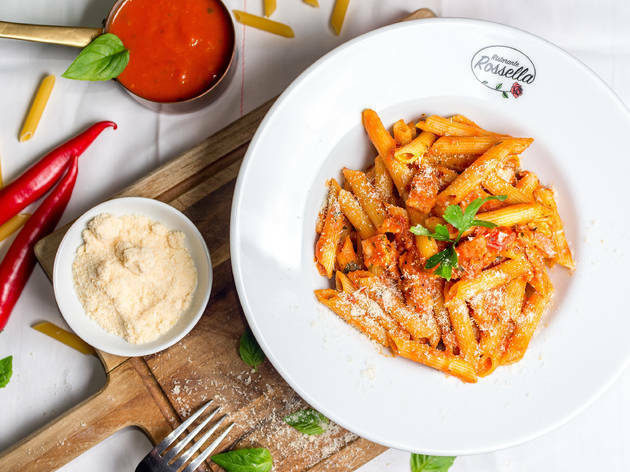 Rossella is a great family run establishment, great food, great value for money! Luca da Man! Tastiest Italian in town! Warmest welcome and nicest staff, you really feel at home. Such reasonable prices and you'll seriously become addicted. A must for all north Londoners! Great little place. Very friendly service. We enjoyed all our food immensely. Good specials. Reasonably priced. Very pleased I live around the corner, especially after the free sambucca! Really lovely food and very decent portions! Love Rosella's. It's a friendly restaurant with a rustic and wholesome menu. Pasta dishes from as little as £5 and the house wine at a bargain price of £12 a bottle. The staff are always on hand to recommend if you can't make up your mind and will throw together anything you fancy. If you go Thursday - Saturday, make sure you book as it's very popular with locals. Tell all your friends! This restaurant is one of the best Italians in north London. It has been a firm favourite with family and friends for years. The varied menu, pasta from as little as £5 or their daily specials, means that their wonderful food is accessible to all. I highly recommend this great little restaurant.